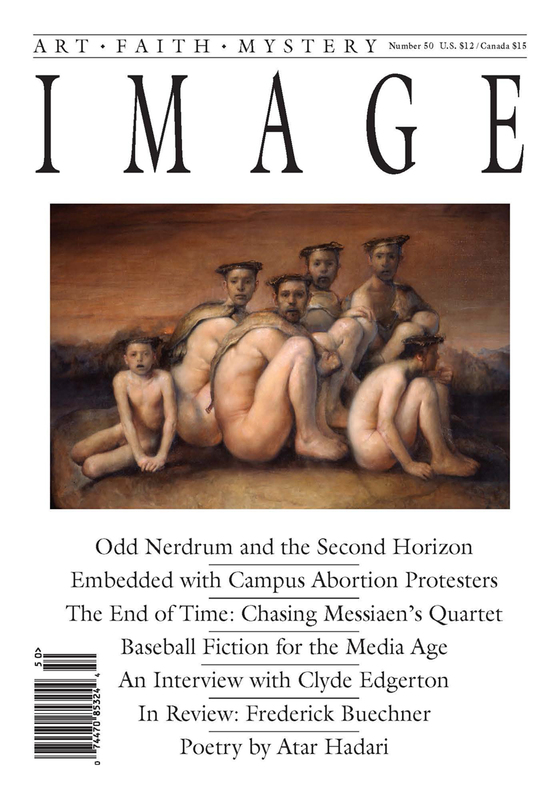 The haunting oil paintings of Odd Nerdrum; Frederick Buechner in review; and Gregory Wolfe on his role as editor over Image’s first fifty issues. Plus, poetry by Atar Hadari, Amit Majmudar, Shara McCallum, and Elizabeth Biller Chapman; an interview with Clyde Edgerton; Ann McCutchan on Olivier Messiaen’s Quartet for the End of Time; baseball fiction; and more. Matthew Ballou earned a BFA from the School of the Art Institute of Chicago in 2001 and an MFA from Indiana University, Bloomington, in 2005. His artwork is included in private and corporate collections and can be viewed at www.eikonktizo.com. He has authored a book on abstraction, One Hundred Permutations, and lives in Evanston, Illinois, with his wife, Alison. Dan Bellm lives in San Francisco. Two volumes of his poetry appeared in 1999: One Hand on the Wheel (Heyday) and Buried Treasure (Cleveland State). His poems have appeared inPoetry, Threepenny Review, Ploughshares, Tikkun, and elsewhere, and his translations of poetry and fiction from Spanish have appeared in many journals and anthologies. His poem “Parable,” first published in Image, appeared in The Best American Spiritual Writing 2004. Elizabeth Biller Chapman lives in Palo Alto, California. Her work has appeared in Poetry,Poet Lore, and the Santa Clara Review, among many other periodicals, as well as in Best American Poetry 2002. She has published two full-length collections: First Orchard (Bellowing Ark) and Candlefish, part of the University of Arkansas Press’s poetry series. Daren Dean holds an MFA from the University of North Carolina at Wilmington, and his work has appeared or is forthcoming in the Chattahoochee Review and Poetry Southeast. He currently teaches composition and literature at Central Methodist University. He lives in Missouri with his wife and daughter. Atar Hadari’s Songs from Bialik: Selected Poems of Hayim Nahman Bialik (Syracuse) was a finalist of the American Literary Translators Association Award. His poems have appeared inAmerican Poetry Review, Times Literary Supplement, First Things, and Jewish Quarterly, where he also contributes a column on art and politics. Judith Harris is the author of the poetry collections Atonement and The Bad Secret (both from Louisiana State). Her critical book, Signifying Pain: Constructing and Healing the Self through Writing, was published by the State University of New York Press in 2003. Her poems have appeared in the Southern Review, Antioch Review, Ploughshares, American Scholar,Prairie Schooner, and Boulevard. Ingrid Hill is the author of the short fiction collection Dixie Church Interstate Blues (Viking Penguin) and Ursula, Under, a novel (Algonquin). The latter won the Great Lakes Book Award for 2004. Her work has appeared in Black Warrior Review, Chicago Review, Indiana Review,Michigan Quarterly Review, Southern Review, North American Review, Story, Shenandoah, and the anthology New Stories from the South. Carol K. Howell is a 1985 graduate of the Iowa Writers’ Workshop. Her fiction has appeared in Redbook, North American Review, StoryQuarterly, Alaska Quarterly Review, New Orleans Review, William and Mary Review, and many other publications. Recently she finished her first novel—about Jewish witches in New Orleans—and is working on a second. Amit Majmudar’s poems have appeared or are forthcoming in Poetry, New England Review,32 Poems, Salt Hill, and other journals. He and his wife live in Cleveland, where he works as a diagnostic radiology resident. Shara McCallum is the author of two books of poems from the University of Pittsburgh Press, Song of Thieves and The Water Between Us, winner of the Agnes Lynch Starrett Poetry Prize. Originally from Jamaica, McCallum directs the Stadler Center for Poetry and teaches at Bucknell University. She is also on the faculty of the Stonecoast low-residency MFA program. She lives in Pennsylvania with her family. Ann McCutchan is the author of Marcel Moyse: Voice of the Flute (Amadeus), The Muse that Sings: Composers Speak about the Creative Process (Oxford), and a wide range of published work, including several libretti. Her personal essays have appeared in Image, Boulevard,Cimarron Review, and other journals. She teaches creative writing at the University of North Texas. Jessica Mesman’s work has appeared in Elle, Creative Nonfiction, River Teeth, and Crisis, among other publications, and on Godspy.com. She lives in South Bend, Indiana, with her husband, writer Dave Griffith (see Image #47). Their daughter, Charlotte, was born December 17, 2005. Julie Mullins is director of programs at Image, where she coordinates the Glen Workshop and works to raise funding for the journal and its related activities. She graduated from Seattle Pacific University with a BA in English and eventually plans to pursue an MFA in creative nonfiction. J. Alicia Shank’s short stories have appeared in several journals, including MichiganQuarterly Review, CutBank, and Calyx. One of her pieces was listed among the “Notable Essays of the Year” in Best American Essays, and another was nominated for a Pushcart Prize. She has received awards from the Center of the American West and the Montana Committee for the Humanities. She lives in Boulder, Colorado, where she writes for The Onion, Rocky Mountain News, and NewWest.net. Elizabeth Smither has published fourteen collections of poetry, including A Pattern of Marching (Auckland), winner of the New Zealand Book Award for poetry, and The Lark Quartet(Auckland), winner of the combined Montana/New Zealand Book Award for poetry. She is the third person and first woman to serve as the Te Mata Estate poet laureate, during which two-year term she wrote Red Shoes (Godwit). Her most recent collection is A Question of Gravity, edited by John Kinsella (Arc). Theodore Worozbyt’s work has recently appeared or is forthcoming in American Poetry Journal, Crazyhorse, Hotel Amerika, New England Review, North American Review,Paris/Atlantic Journal, Ploughshares, and Southern Review, and on the web at Mississippi Review Online, Verse Daily, and Poetry Daily. His collection, A Unified Theory of Light, winner of the 2005 Dream Horse Press chapbook competition, will be published in 2006.